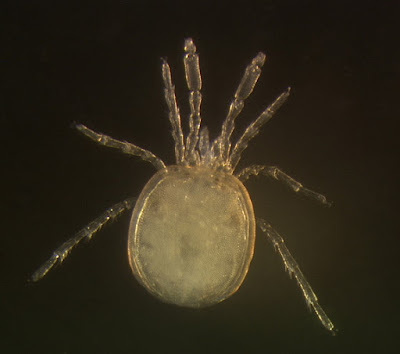 Stygomomonia sp., from Water Mites of North America. The Momoniidae are a group of more or less well-sclerotised, interstitial or hyporheic water mites whose larvae, where known, are parasites of Trichoptera (Walter et al. 2009). Characters (from Walter et al. 2009): Adults with tibia I much longer than tarsus; claw of leg I flexing proximad to oppose dorsal surface of tarsus. Larva with idiosoma moderately flattened dorsoventrally; gnathosoma projecting beyond anterior edge of dorsal plate, entirely exposed in dorsal view; dorsal plate bearing four pairs of setae (verticils and scapulars), with setae c1 on lateral membranous integument; setae c2 and d2 thick and long relative to other hysterosomatic setae; excretory pore setae ps1 and ps2 absent, represented by their alveoli on excretory pore plate; legs with five movable segments; leg genua with setae Ge5 borne on tubercles; tibia I bearing eight setae (+2ϕ), including Ti11; leg tarsi lacking setae Tal4, bearing paired claws. [EHH05] Eberhard, S. M., S. A. Halse & W. F. Humphreys. 2005. Stygofauna in the Pilbara region, north-west Western Australia: a review. Journal of the Royal Society of Western Australia 88 (4): 167–176.